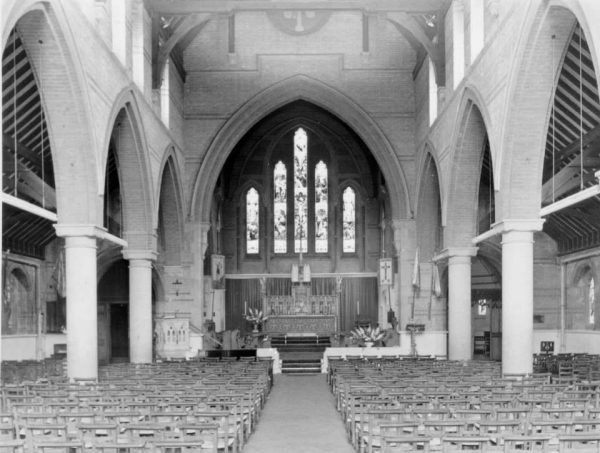 After the formation of a separate parish of Bognor, plans emerged for the replacement of the existing church of St John the Baptist, Steyne on the grounds that it was too small, as well as being poorly built and on a constricted site. The first application was made to the ICBS in 1873, but the foundation stone was not laid until 1880, to be completed two years later to a design by Sir A W Blomfield (A 28 p135). Since the older church was to be demolished, the new one took its dedication. Built of flint with brick dressings, it was, like many of Blomfield’s churches on the south coast, large and unoriginal, though it had a tower surmounted by a tall broach spire of stone. Such a feature is not found on most of Blomfield’s other churches in the county and suggests that the budget was more generous, though it was not added until 1895. The interior was spacious and was originally faced with polychrome brick with a form of hammerbeam roof in the nave. 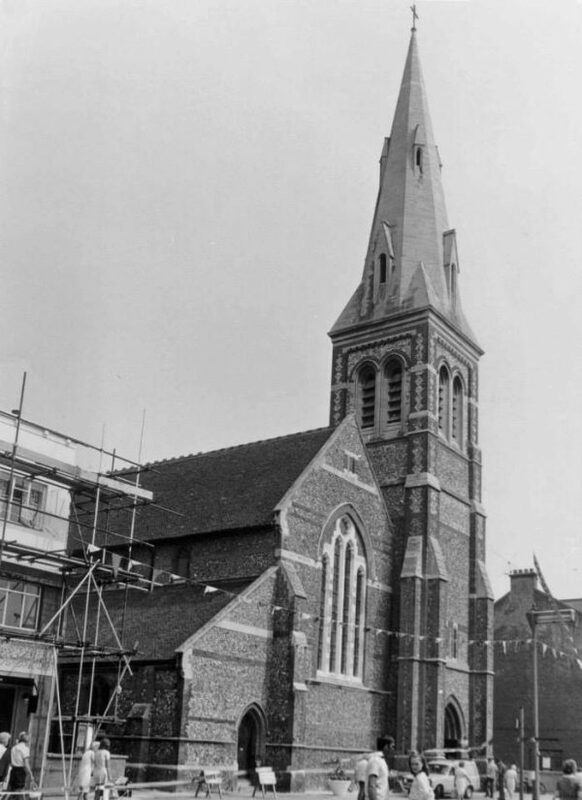 The church stood on a prime site and following closure in 1971, it was demolished in 1972-73, to be replaced by shops. Arms: Archbishop Manners of Canterbury who consecrated the original church in 1822, which were transferred first here and subsequently to the church of St Wilfrid. Font: Square with a bowl inlaid with marble and stumpy shafts on the base of the same material. Pulpit: Stone and of some pretention with open traceried sides and marble shafts.